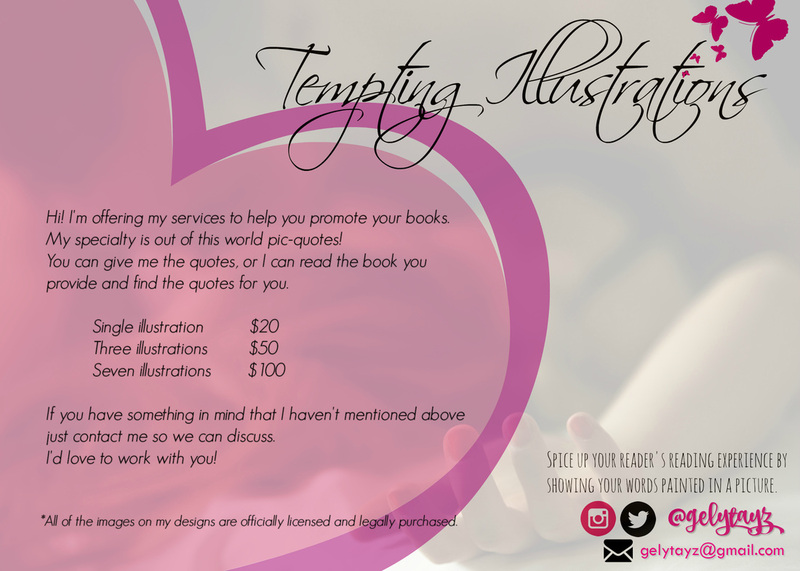 As some of you might know, I'm a content writer/illustrator from Tamie's Bookish Temptations book blog. This 2016, I decided to chase my dream and start doing it now. I love putting words into pictures. I started three years ago when I landed into twitter and met some fabulous people with the same interest as me--reading. So I made some illustrations to show my love and support to my favorite authors. I was overwhelmed by how people approached me to say how beautiful my creations were and that they really match the scenes from the book. During those times I was just having fun. A hobby, you might say. Until one day, this awesome Lady asked if she could hire me to do this and that for her. At first I felt a bit awkward charging someone for my artwork. Then I realized that I wanted to do this full time. So here I am. I am so blessed by all these amazing people around me who give their all out support in all the things that I do. ​So I would like to send a big virtual hug and a huge THANK YOU note from across the miles! My designs are mostly simple and clean, yet elegant and sophisticated. I'm open to your ideas if you have something specific in mind. I promise that I'll do whatever I can to execute it for you. -Time Frame- If you want a single illustration I'll need at least 24-36 hours notice. Contact me as soon as possible with all the details that I need to know. If you want me to read the book and find the quotes for you (since that's my specialty), I prefer at least two weeks notice before release day. If you'll need the teasers earlier than the release day for promo, please contact me at least two weeks before they're needed. -All the images that I will be using for your illustrations are licensed and legally purchased. I reserve the right to reuse the images for my designs but of course not the finalized product. Rest assured that no designs are alike. I'll do my magic to make sure that yours is exceptionally different among others. Every illustration is special in it's own unique way. If you have an image/material of your own that you would like to use, of course that's possible too. -Payment is thru Paypal. I included my pricing below (USD). In case you need something different which is not included in my pricing, just let me know and we can discuss.